Almost two decades ago, President George H.W. 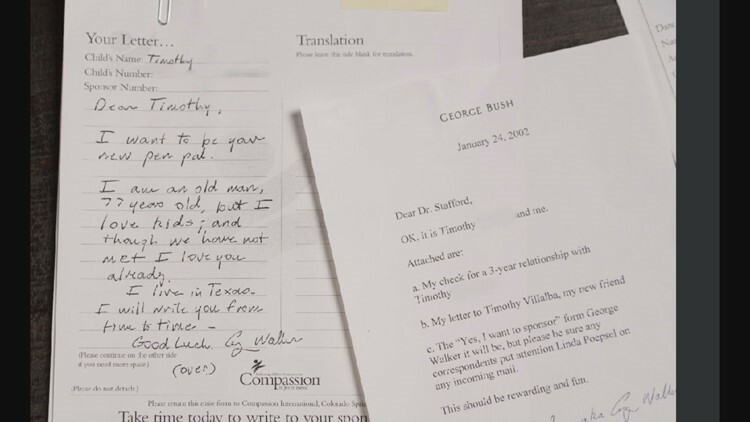 Bush was at a concert when the performers asked if anyone would sponsor a child through nonprofit Compassion International. Bush raised his hand and picked a child from a pamphlet. "I could see the security people going is this OK? You know has anyone checked this for anthrax," said Dr. Wess Stafford, Compassion International's President Emeritus. Stafford spoke with security and they agreed it would be best if no one knew about the sponsorship to protect the child's safety. “They couldn’t use his name George Herbert Walker Bush, but they did go with George Walker," said Stafford. 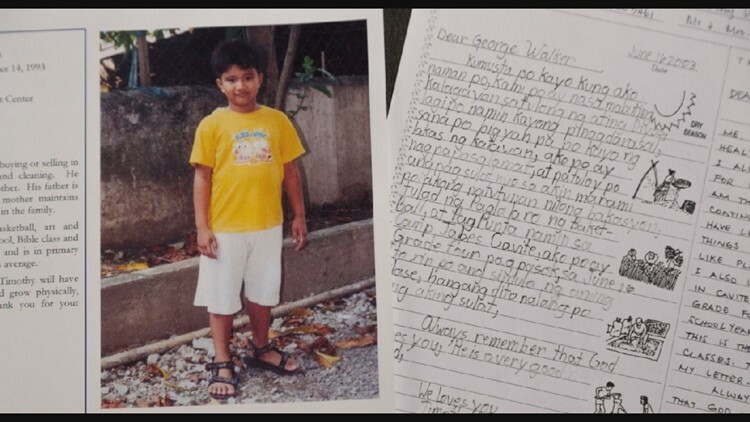 That's how a man by the code-name George Walker began writing letters to a Filipino boy named Timothy at the start of the millennium. “And so I pondered, well he’s lying in state there, we don’t have to be as secretive about it, there’s no risk anymore," said Stafford. 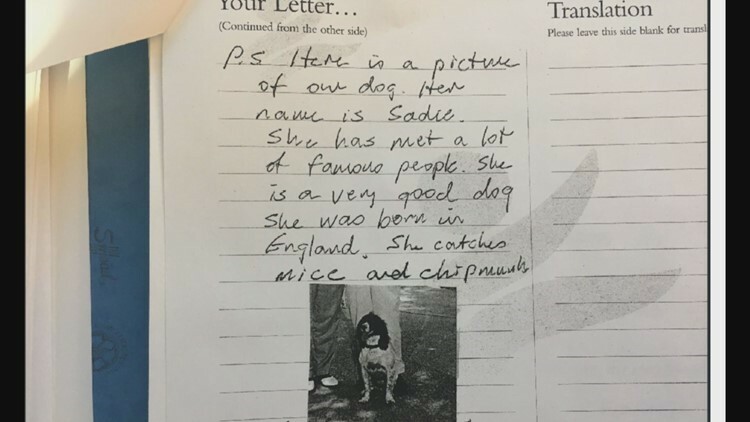 Bush wrote about his dog Sadie and how she's met a lot of "famous people." 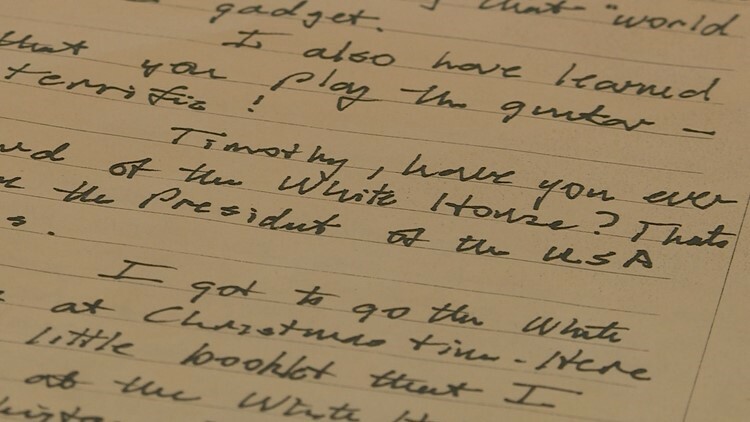 He wrote about visiting the White House for Christmas. "And I'm like, it's getting dangerous here," laughed Stafford. He also asked Timothy all about school and even sent him a calculator and art supplies. Timothy, now 25, found out who his sponsor was a few years ago when Stafford's secretary took a trip to the Philippines and visited him. She said he was overwhelmed and had no idea the President of the United States might ever even know his name. If you'd like to sponsor a child through Compassion International, you can click here.